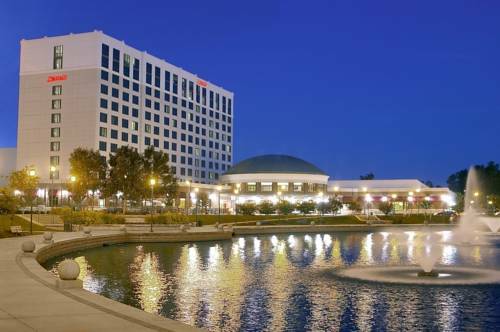 Experience the perfect blend of style, sophistication and substance when you stay at Newport News Marriott at City Center. Providing easy access to many popular attractions in the area including Hampton Coliseum and Christopher Newport University, our hotel is an ideal spot to explore Virginia from. Before your eventful day, take care of any lingering work responsibilities using your room's ergonomic workstation and high-speed Wi-Fi. Rest up on our luxury bedding while browsing the options on our flat-panel TVs. When you get hungry, fuel up at our on-site restaurant, Kitchen 740, and enjoy creative appetizers and hearty entrees for breakfast, lunch and dinner. Our fitness center offers cardio equipment and free weights so you can work up a sweat anytime. After a workout, take a refreshing dip in our indoor pool. Whether you're meeting with potential clients or simply discovering what eastern Virginia has to offer, you'll be living luxuriously with a getaway to Newport News Marriott at City Center. Kitchen 740 at Marriott at City Center: Treat your taste buds to a mouthwatering meal in the heart of Newport News. Creative appetizers, salads, sandwiches and entr es light up our restaurant's lively menu. Visit our bar, open until 1am, for plenty of seating and TVs broadcasting sports.